So we have made it to Shillong after what was a somewhat hair-raising 3-hour taxi ride out of Guwahati. Our first attempt at midday to get a taxi was met with the reponse of not possible. Shillong is closed. Come back at 3pm. When we eventually did get a taxi amongst the cows wandering around the arrivals pick-up point, next was a hunt for petrol. The strike had pretty much closed everything down including petrol stations, but we were soon on our way, dodging trucks, which had signs painted on their rears of “Drive slow, Long Life” and “Please blow horn”. Anyway everyone has made it pretty much intact, except Dave whose luggage is either in Paris, Delhi or somewhere in-between. 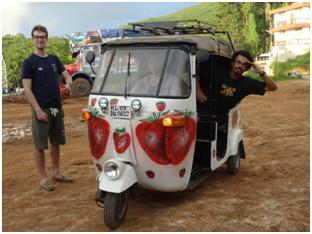 Rickshaw Riders are appearing everywhere, easily spotted on the plane, airport arrivals and in taxis heading to Shillong. There is a large rambunctious Aussie contingent, some very tall Danes apparently sponsored by some billionaires, a smattering of Americans and a mix of just about every other nationality, including the first Egyptian, Saffi, in the history of the Rickshaw Run. There is an 85:15% ratio of male to female which suits the girls just fine! One guy however has decided, absolutely seriously, that he is going to need to buy a goat for company. Rakesh gave us a quick introduction to the mechanics, registration completed with Matt and a few signatures handing over our tuks and it was onto the road for a test drive. The test ride has in part given us some confidence, in part given sight of the challenges ahead and a realization that passengers will be a crucial part of the driver’s ability to know what is going on behind them. 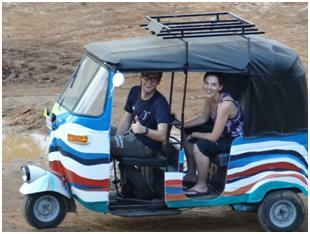 Driving a tuk tuk is something like patting your head and rubbing your stomach. It also turns out it is not rude but imperative to use your horn in India, it is part of road etiquette as is not sticking to your lane. 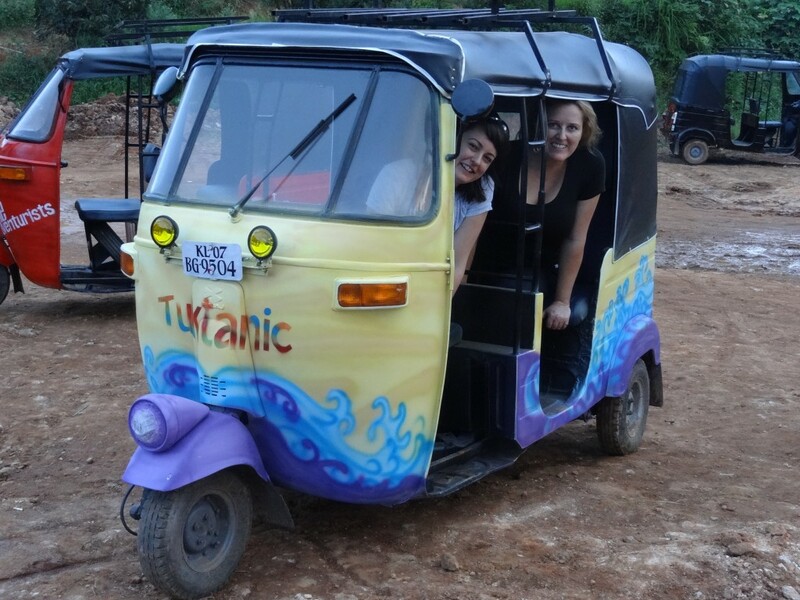 Plenty of stalling, blisters on hands, cranking the starter and nervous navigation but at least none of us overturned our tuk tuks as one team managed to do. The locals have been so welcoming, stalling at a junction, a guy quickly jumped in to help us get it started again and out of the way of the traffic. On a forest road an elderly lady joined us pushing our tuk tuk with advice on driving early during the day to avoid the traffic.